Not every married couple files a joint chapter 13 bankruptcy case. However, the income and expenses of the non-filing party is critical in determining how much the filer has to pay per month to a Chapter 13 trustee and for how long. This relatively new concept stems back to the bankruptcy reform of October 17, 2005. Prior to that date, a person filing for Chapter 13 bankruptcy was only required to submit his or her income and expenses as well as all of the debts. 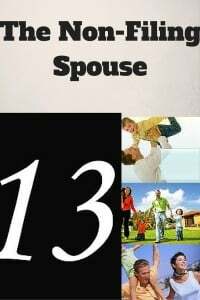 After the law change, the non-filing spouse or the total household income of the parties became the standard by which chapter 13 cases were governed. A woman came in the office recently to file a Chapter 13 bankruptcy. Her income was relatively small. However, her non-filing spouse had high income as he worked for the Chicago public school district. When I advised her that his income was a factor, she questioned as to why. I explained the concept of total household income and that the non-filing spouse is technically supposed to help contribute toward the parties’ debts. She was shocked by that because the debt was exclusively in her name that she was trying to include in her chapter 13. Before she got too upset with the state of the law, I explained to her that we can use her non-filing spouse’s debts as well to offset some of his income. Thus, when we took into account his auto payment, his auto insurance, his credit card debt servicing, and his child support that he was paying to a separate woman, his income although excessive, turned out to be not quite that big of a factor. Once she realized this fact, we were able to proceed with a chapter 13 bankruptcy filing at a monthly payment that she could afford. The example above illustrates how important it is to file with an experienced, qualified attorney in your local area. Many people decide to file bankruptcy on their own thinking that they will get help from the court clerks as well as the judges in navigating a chapter 13 case. What people often discover is that the court can only give non-legal advice and most importantly they cannot advise the client on any legal matter. By the same token, the Chapter 13 trustee would much rather see the debtor represented by counsel so that the case will be administered effectively. If you made the mistake of filing pro se and you have found yourself in a situation where your case is about to be dismissed, I may be able to assist you by either saving the existing case or by recommending a refiling so that you can start over fresh again. For more information on how chapter 13 laws can help you, contact my office at 847-520-8100. If you are married, keep in mind that your spouse if he or she does not wish to file with you will still have to provide income and expense documentation under existing laws. There are some circumstances where the non-filing spouse’s income would dictate a much higher monthly plan payment than the debtor can afford. In those situations, we may recommend not filing a Chapter 13 and exploring some non-bankruptcy alternatives.